This single book is renowned globally as the most thorough explanation of all Universal Law set in motion by the Creator. Raymond Holliwell explains how our inner thoughts represent our real motives and desires and how those very thoughts create ideals, principles and ruling desires that cause action in each of our lives. Ultimately, then, it is our thought that determines our destiny as it is our thought, alone, that either works with or against the Laws of Nature. 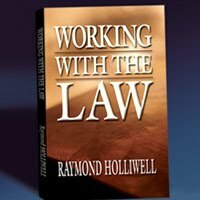 Working With the Law - There is a marvelous inner world that exists within man, and the revelation of such a world enables man to do, to attain, and to achieve anything he desires within the bounds or limits of nature. Law of Thinking - The mind force is creating continually like fertile soil. Nature does not differentiate between the seed of a weed and that of a flower. She produces and causes both seeds to grow. The same energy is used for both and so it is with the mind. The mind creates either good or bad. Your ideas determine which is to be created. Law of Supply - Man possesses the whole world and all its wealth, yet is only able to enjoy what his consciousness permits him to discern. The thing we dare not do is fret and worry about supply or about where our next dollar is coming from. Law of Attraction - Never expect a thing you do not want, and never desire a thing you do not expect. When you expect something you do not want, you attract the undesirable, and when you desire a thing that is not expected, you simply dissipate valuable mental force. On the other hand, when you constantly expect that which you persistently desire, your ability to attract becomes irresistible. Law of Receiving - Many try to work the Law backwards and for that reason get little or no results. They say to themselves, "Well, after I get, then I will give." If you wish any good thing, you must first give some good to build upon. Law of Increase - In using this Law, we stimulate our good and bring about much for our pleasure and happiness that seems like magic or miracles. This understanding is the act of praising God, the Law, for that which we desire, and invariably the fulfillment of that desire is speeded up to almost magic proportion. Law of Compensation - If you are not succeeding, if you lack any good thing, look more closely to the cause. It is not outside; it is somewhere within. See where you fail in your consciousness to think rightly. There are three points common in everyday life where one may fall into a snare and a delusion. Law of Non-Resistance - This Law does not require us to work over or against the things we do NOT want, but it does require us to work with and for that which we DO want. Remember, it is not the movement of a machine that wears it beyond use and service, it is FRICTION. Friction is opposition and resistance. Law of Forgiveness - We must forgive, forsake and forget that thought or person or condition which prompted the resentment. IT means to abandon or let go of the thing you ought not to do. To abandon or release the wrong thoughts or idea is to be absolved and liberated from its effects. Law of Sacrifice - No one can attain his ambitions until he learns to discipline his mental force and is able to control his thinking. We are sacrificing every day of our lives whether we want to or not, whether we know it or not. Law of Obedience - Whatever Law you obey will, in turn, serve you. The most important thing, then, is to know what to obey. Law of Success - Man is made for progress. Every man contains within himself the capacity for endless development. If we think supply depends upon people or material conditions and then are worried, conditions go from bad to worse. Half our failures, then, are that we pull in at the moment when we should let all our forces out to have full vent as we make a leap.